THE HESLOP HOUSE: PEAS! MMMMM! I DECIDED TO TRY PRESLEY ON SOME VEGETABLES, I TRIED ALL THE YUMMY ONES FIRST AND SAVED THE DREADED PEAS FOR LAST, BUT UN BENOUNCED TO ME, SHE LOVES THEM!!! ALL OF THEM!!! THE FLASH ON THE CAMERA REALLY TOOK HER OFF GAURD. MAYBE SHE DOESN'T REALLY LIKE THEM, MAYBE SHE JUST LIKES WEARING THEM! 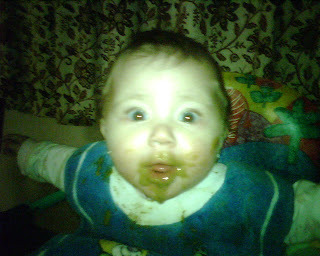 OH, THE FUN OF LEARNING HOW TO EAT. SOMETIMES I WOULD RATHER WEAR MY PEAS TOO!